We’d love your help. Let us know what’s wrong with this preview of Road to Valor by Aili McConnon. Road to Valor is the inspiring, against-the-odds story of Gino Bartali, the cyclist who made the greatest comeback in Tour de France history and secretly aided the Italian resistance during World War II. Gino Bartali is best known as an Italian cycling legend: the man who not only won the Tour de France twice, but also holds the record for the longest time span between Road to Valor is the inspiring, against-the-odds story of Gino Bartali, the cyclist who made the greatest comeback in Tour de France history and secretly aided the Italian resistance during World War II. Gino Bartali is best known as an Italian cycling legend: the man who not only won the Tour de France twice, but also holds the record for the longest time span between victories. During the ten years that separated his hard-won triumphs, his actions, both on and off the racecourse, ensured him a permanent place in Italian hearts and minds. After the grueling wartime years, Bartali fights to rebuild his career as Italy emerges from the rubble. In 1948, the stakes are raised when midway through the Tour de France, an assassination attempt in Rome sparks nationwide political protests and riots. Despite numerous setbacks and a legendary snowstorm in the Alps, the chain-smoking, Chianti-loving, 34-year-old underdog comes back and wins the most difficult endurance competition on earth. Bartali’s inspiring performance helps unite his fractured homeland and restore pride and spirit to a country still reeling from war and despair. To ask other readers questions about Road to Valor, please sign up. Non sono mai stata una grande appassionata di ciclismo, eppure questo libro va al di là dello sport per soffermarsi sull’Uomo e sulla Storia, per illuminarci su anni assolutamente bui della storia italiana attraverso un racconto meraviglioso. Questa biografia di Gino Bartali, concentrata in particolare negli anni della Seconda guerra mondiale, va ben oltre i successi agonistici di “Ginettaccio”, tanti e prestigiosi, conquistati con lo sport un tempo ritenuto nazionale, seguito dalle folle alla st Non sono mai stata una grande appassionata di ciclismo, eppure questo libro va al di là dello sport per soffermarsi sull’Uomo e sulla Storia, per illuminarci su anni assolutamente bui della storia italiana attraverso un racconto meraviglioso. Questa biografia di Gino Bartali, concentrata in particolare negli anni della Seconda guerra mondiale, va ben oltre i successi agonistici di “Ginettaccio”, tanti e prestigiosi, conquistati con lo sport un tempo ritenuto nazionale, seguito dalle folle alla stregua di un’espressione popolare in grado di rappresentare gli umori di un’intera nazione. A renderlo eroico ai nostri occhi di posteri (ma anche ai contemporanei…) è, probabilmente, la sua normalità: il suo coraggio è stato sempre discreto, mai eclatante. Tutto questo deriva anche dall’educazione ricevuta, legata in particolare alla religione cattolica e ai valori socialisti trasmessi dal padre Torello. I due fratelli McConnon autori del libro sono andati a scavare nei solchi delle vicende sportive di quegli anni, realizzando un libro assolutamente perfetto. Bartali vinse il Tour de France a istanza di 10 anni, nel 1938, poco prima dello scoppio della guerra, e nel 1948, dopo la fine della guerra, quando era dato per finito. E in questi 10 anni cosa è successo? Viene così ricostruita la storia di Bartali durante gli anni di dominio fascista, quando il corridore ha trionfato nella vita in maniera differente rispetto alle solite gare ciclistiche. Negli anni delle persecuzioni nazi-fasciste Bartali ha continuato ad allenarsi a modo suo, girovagando per la Toscana e le regioni vicine trasportando nel telaio della sua bicicletta documenti falsi per gli ebrei in Italia; Bartali era un anello fondamentale di un’associazione impegnata nel mettere al sicuro quanti più ebrei poteva, sottraendoli alle deportazioni di massa. Fu così che salvò delle vite, in silenzio, senza clamori, semplicemente facendo quello che gli riusciva meglio: pedalare. Anche negli anni successivi alla fine della guerra Bartali non approfondì mai questo importante aspetto della sua vita: nella sua umiltà credeva che non fosse giusto dare risalto al suo ruolo, quando probabilmente ci furono persone che rischiarono maggiormente la vita o addirittura morirono. La bellezza di tutta la storia sta anche in questo, nella normalità e nella semplicità con cui ci viene raccontata: in questo modo l’umanità di Gino risplende, nonostante il suo carattere spesso scontroso e vulcanico. A very pleasant surprise, this book popped up on my radar screen out of nowhere - why didn't I see it when it came out? (since it's right up my alley)... Anyway, I was shopping for a copy of an old favorite (as a gift), and this showed up in the folks who bought that book also bought this one column, so I figured, why not?, and I'm glad I did. I rated this 5 stars on the research and the story, which were both remarkable (and impressive and gratifying). In parts, the work is peppered with dollop A very pleasant surprise, this book popped up on my radar screen out of nowhere - why didn't I see it when it came out? (since it's right up my alley)... Anyway, I was shopping for a copy of an old favorite (as a gift), and this showed up in the folks who bought that book also bought this one column, so I figured, why not?, and I'm glad I did. I rated this 5 stars on the research and the story, which were both remarkable (and impressive and gratifying). In parts, the work is peppered with dollops/portions of biography, sports history, holocaust/WWII underground railroad testimonial, political thriller, travelogue, and ... more. Quite simply, the book covers a lot of ground. Sure, there's plenty of reasons to think of, by way of analogy, Laura Hillenbrand's Seabiscuit or Unbroken and, maybe Daniel James Brown's Boys In the Boat.... As I was reading it, I also kept thinking about Corrie Ten Boom's incredible The Hiding Place, and, on the fiction end of things, Kristin Hannah's The Nightingale, (although that's a lousy analogy). Heck, I was even reminded of Markus Zuzak's (yes, the one that wrote the deservedly popular The Book Thief) less well known book, I Am The Messenger (but now I'm free associating). Unlike much of the World War II and holocaust reading I've done - military history, chronicling of the holocaust, and, of course, fictional accounts of the era - this focused much more on Italy, Italian history, and of course, Italian politics, religion, and sport ... much of which proved novel and fresh and interesting and informative. Reader's nit: a number of things about this book frustrated me to no end, and, if the story wasn't so incredible (and entertaining), I easily could have given up. Predominantly, but, among others: while this is a book about a cyclist and bicycle racing on the grandest stages, the authors aren't well, bicycle racing journalists and (even though one of them has experience writing for Sports Illustrated, ... and, apparently, they had help from at least one expert, but...) well, let's just say that they didn't write like they loved bikes or cycling racing (indeed, it felt like they were consistently apologizing for writing about, or because people cared about, bikes and racing ... and their coverage of races (minor and major) or the sport surely doesn't read like it's been pulled from the pages of Velonews, or Cycling News, or ProCycling, or.... For general readers, that's probably a good thing, but for bike geeks, there were innumerable stretches where I expect others will also want to pull their hair out (for example, during races - including lengthy, multi-day races - where no other riders' names were mentioned). But here's the thing - and it's a big thing - I started the book with low expectations, but, after a few pages, I couldn't put it down. It sucked me in, the story was captivating, and the authors brought life to the players such that the whole steadily worked its magic throughout. “Road to Valor” is a heartwarming story. I’m not someone who’s interested in bicycle racing but I love history. This book has both. Gino Bartali was born at a time, 1911, when the bicycle craze was at its peak. Even as a small boy all he seemed to think about was riding a bicycle as fast and for as long as possible and he was good at it. Of course so were many other Italian boys but not all of them had Gino’s discipline and drive. Prior to World War II he began making his name known. During the war he officially and unofficially rode missions for the sake of Italy. He’d always been a devote catholic and believed in democracy so he was conflicted when fascist Mussolini was in power. He searched his soul and found a solution. He combined his faith and his politics and joined with some local priests in shuttling false ID information to printers to help smuggle Jews and other political prisoners to safety. He even personally housed and protected a Jewish family. These activities were gravely dangerous. Of course none of this was known during most of his lifetime. His bicycle racing prowess made his name. He won the famous Tour de France in 1938 and, miraculously, for such a mature man, in 1948. The ’48 race was won at the express request of his government. It was a time of social unrest when the communist leader, Palmiro Togliatti, had been shot and it was feared he’d die. The Prime Minister, Alcide de Gasperi, telegraphed Bartali during the race and asked him to help quell the rioting by giving his countrymen a reason to join together. Bartali was up to the task but at great cost to himself. This is an inspiring story but as I said the detailed racing information stalled the story somewhat. Over all it was an inspiring story. This review was based on an e-galley supplied by the publisher. 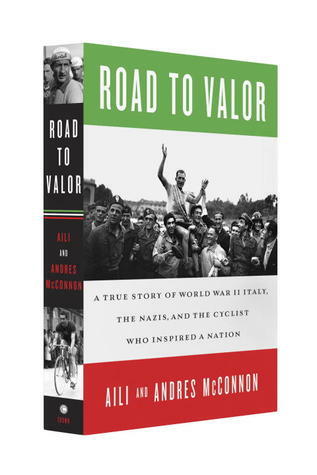 Road to Valor: A True Story of WWII Italy,the Nazis, and the Cyclist Who Inspired a Nation, by Aili and Andres McConnon was a page-turner for me. Once I began it, I couldn’t put it down. I was mesmerized and captivated by the compelling, intense, and true story of Gino Bartali, an Italian cyclist. But, he was much more than that, as it turned out, as I read with hardly a break between pages. Born of poverty, in the small town of Ponte a Ema, in 1914, he would eventually become larger than life, a Road to Valor: A True Story of WWII Italy,the Nazis, and the Cyclist Who Inspired a Nation, by Aili and Andres McConnon was a page-turner for me. Once I began it, I couldn’t put it down. I was mesmerized and captivated by the compelling, intense, and true story of Gino Bartali, an Italian cyclist. But, he was much more than that, as it turned out, as I read with hardly a break between pages. Born of poverty, in the small town of Ponte a Ema, in 1914, he would eventually become larger than life, a legend in his own time. Yet, little was known about his other passion, helping to save Jews during World War II. He was a silent hero. From the moment he saved up enough money to buy his first bicycle, along with a bit of family financial help, cycling became the love of his life. He would cycle the mountainsides, the hillsides, the winding roads, inhaling the countryside, becoming one with the landscape. He dreamed of cycling, and was determined to win the Tour de France. Not only did he accomplish that goal, he did it twice, ten years apart, first in 1938 and again in 1948! The lapse in winning was due to World War II, when cycling took a back stage to the events of war, and due to the fascist situation in Italy. When he did cycle, it became political motivation, which was not his intention. He did not side with fascism or with the Nazis. In fact, as the story unfolds we read otherwise. Bartali risked his life during the war to shelter Jews and to save them by helping pass false identity cards that he hid in his bicycle. He not only incurred risk for his own life and their lives, but also for his family. He would meet various individuals in secret locations and pass the identity cards to them. Often times, he would not see their faces, which was intentional, so nobody could be identified if ever questioned by the authorities. Within the pages, the reader also gets glimpses of how cycling overtook Italy as a form of transportation, due to the economic situation and political pressures. The reader is given insight into Italian World War II history, including fascism, Mussolini, the horrific hardships that the nation, as a whole, faced during this tumultuous time period. It depicts the horrendous treatment of the Jews of Italy by the ruling factions. It also evokes the integrity and humanity of every day individuals under extreme duress. The war cost him chances to engage in varied cycling events, but he never gave up hope of winning the Tour de France a second time. He persevered, and in it he did, with ferocious strength, which at the time was thought impossible due to his age. In his eyes, though, that win was the lesser of his accomplishments. Those words encompass Bartali’s train of thought, and the reader feels it reign supreme throughout the story. His cycling journey took him to journeys of the soul, of the spirit of mankind. His life was one of humaneness and goodness, within his often boisterous presentation to those in the cycling world. Little did they know of his kindness and risk taking in order to rescue Jews. I have been enriched, emotionally and historically speaking through reading Road to Valor, by Aili and Andres McConnon. Their contribution to Italian history during prewar and the war itself, is immeasurable. Their research was more than thorough, and their interviews and other factors of information gathering was an endeavor of high accomplishment. I had not heard of Gino Bartali before reading this book, I do not follow the Tour de France and know very little about the sport. I read this because I always enjoy books about WWII and I really enjoyed this one. I usually read historical fiction and was concerned that this book might be a boring but Bartali is a larger than life character that was so fascinating to read about that I was not bored once through the entire book. The authors do a great job of beginning the story with Bartali's stru I had not heard of Gino Bartali before reading this book, I do not follow the Tour de France and know very little about the sport. I read this because I always enjoy books about WWII and I really enjoyed this one. I usually read historical fiction and was concerned that this book might be a boring but Bartali is a larger than life character that was so fascinating to read about that I was not bored once through the entire book. The authors do a great job of beginning the story with Bartali's struggles in his early years and really showing his passion for bicycles. They also wrote about the importance of bicycles in Italy during this time in general and how many of the population used them for their main form of transportation. I love reading books about Italy and this book gave me a whole new look at the country. I usually read about the countryside and the food, in this one I read about the poor neighborhoods and what bicycle races meant to so many people in the country. The actual races that are discussed were fun to read about. I had no idea that the races were as long and dangerous as they were described in the book, it made for an exciting read. I have so much more appreciation for the strength and endurance of the racers in this sport. There is lots of information about the politics in Italy during this time. Since I do read a lot of WWII books I did know some of the things talked about but I got a much more in depth idea of the different political problems facing the country. Mussolini is discussed often, he would hinder Bartali a few times in his quest for winning races. The parts about Italy during the war are at times heartbreaking, the people suffered to much. It was really inspiring to see men like Bartali risk their lives to help others that had little hope. Gino Bartali was already a hero of mine. He won the Tour de France in 1938, and then again - an almost professional career's worth of ten years later in 1948! To win cycling's greatest race twice is some achievement, but to do so after such a long gap between the victories is something extraordinary. It had never been done before and hasn't been done since. I doubt it ever will. No doubt, if it weren't for the war interrupting his career when at its peak, he would have won several more Tours. I had also heard a little about his anti-Fascist persuasion before and during WWII, but really knew nothing of it. And finally, there was his fierce rivalry with compatriot Fausto Coppi. Some consider Coppi the greatest cyclist of all time... their rivalry probably was. Road To Valor tells the story of Gino's conservative and traditionally Catholic upbringing in the Florence district of Tuscany. Together with his brother he becomes an avid fan of cycling and loves the independence that owning his first hard-earned bicycle gives him. He has a job in a local bike workshop. Here he makes the acquaintance of a Giacomo Goldenberg. As the sibling authors tell of Gino's rapid rise through the ranks of Italian semi-professional and then professional cycling, we learn a little more of life under Mussolini's Fascist regime. Gino isn't particularly affected by it until he starts to compete in Italian national colours in the Tour de France. When in 1938 he is denied the chance to win his third Giro d'Italia in a row, the Fascist cycling authority insist he is kept back so that he will compete for the more international honour of winning the Tour. Honour for the regime of course - as seen when the Italian football team wins the World Cup in both '34 & '38, for which the Fascists claim an integral role in the success. After his beloved brother's earlier untimely death in a car accident, Gino had devoted himself increasingly to the church and is quite involved with Catholic Action - one of the few non-Fascist organisations permitted at the time. He counts Bishops and Monsignors among his friends. Upon managing to succeed in the 1938 Tour with only the second ever Italian victory in that event, Gino's victory speech is seen in the Fascist press back home as a thinly disguised anti-regime attack - after all he thanks the church and of course God for his achievement, but neglects to praise Il Duce at all. Gino's card has been marked in some quarters. As part of Gino's mobilisation, he was first required to undergo a routine medical checkup to determine his specific assignment...The military doctor listened to his heart and found it was beating irregularly, a condition that Gino was unaware of, but that had never seemed to impede his cycling. Still, the doctor was puzzled, and called in a colonel for a second opinion. The colonel looked at the heart rate and rejected Gino as unfit for military service, unaware that he was evaluating one of the nation's cycling stars. The irony - a Tour de France winner only two years earlier rejected as unfit for active service in Mussolini's forces! Gino is assigned to serve as a bicycle courier rider in the Tuscany region where he lived. One could say this was a fairly cushy option, given that there were no longer competitive races, he could at least stay fit as he could carry on the lengthy training runs so crucial to maintaining his stamina and fitness. The parallel story of the Jewish Goldenberg family in Florence is told over the same period. Giacomo had been kept in an internment camp early in the war, but subsequently released. As the war progressed, and Mussolini's regime eventually collapsed in 1943, the Nazi Reich took a direct role in controlling the puppet Salo regime - with the mighty Il Duce at its head of course. After his earlier release from the camp Giacomo no longer heard from his cousins and feared they'd been re-arrested by the newly revitalised German-backed police state. Fearing for his family's safety he arranged to split them up, and sent his 11 year old son to a religious boardinghouse which covertly cared for Jewish children on the Archbishop of Florence's request. But what for the rest of his family? After reaching out to his old friend Sizzi (the bike mechanic where young Gino had once worked) who wished to help, but lacked any resources, Giacomo was put in touch with Gino himself. At a time when informing on Jews' whereabouts could be rewarded by four times as much money as could be 'earned' by doing likewise with an escaped Allied prisoner, it had become potentially punishable by death to shelter Jews. After a fairly lackadaisical attitude towards their Jewish citizens early in the war, the new regime was now actively deporting people to the death camps. With a young wife and baby son to support, Gino didn't know what path to take. He wanted to help, but the danger involved was certainly overwhelming. He sought counsel with his friend the Archbishop of Florence, and contemplated the choice before him in the peace he could only find at his brother's graveside. Without involving his wife, and without implicating her at all, he came to a decision: He would hide them in the cellar of a downtown Florentine apartment he was the co-owner of. Gino didn't stop there. His unique position as a friend of the Archbishop and other high ranking church officials, as well as his privileged courier role in the Army, allowed him the rare opportunity of acting as a valuable go-between. He was carefully brought in by other brave men of the church to act as the courier of vital papers and photographs for the purposes of forging life-saving identification cards and other documents. With the confidence of a local Florentine family printers' firm, Gino would collect the valuable papers from a given safe house or other location, stash them inside the frame tubing on his bike - beneath the saddle post - and then (via the forger's printing press to produce the required items) ride several hundred kilometres (as only a Tour de France champion could!) cross-country to the ring's HQ at the Abbey in Assisi where the other end of the operation would pass the documents on to the desperate Jews waiting to get out of the country to safety. For Jews in Italy like the Goldenbergs, life had entered a new nightmare phase. The Germans and their Fascist collaborators ratcheted up the intensity of their persecution, even as it became increasingly clear that they would be defeated in the war. In addition to raiding convents and monasteries, Nazis invaded old-age residences and hospitals looking for Jews. The numbers soon illustrated the results of their murderous zeal. By the spring of 1944, little more than six months into the occupation, more than 6500 Jews (both foreign and Italian) had been carried by train from Italy to Auschwitz alone. after the war's end, Gino was beaten by the younger Fausto Coppi at the 1947 Giro d'Italia (although Gino was King of the Mountains and won two stages - even dismounting once mid-stage to punch an anti-Catholic slurring spectator, before remounting to claim the day's victory!) and did not even enter that year's Tour de France - the first since the end of hostilities. In the build-up to the '48 Tour his chances were written off by the press. Post-war Italy was a very volatile place, and the country was split down the middle in support for either the Communists or the more conservative Christian Democrats. This at the time of Churchill's 'Iron Curtain' speech, and the fast-emerging Cold War, Italy's role in Europe was central in more ways than one. When in July 1948 an unstable Fascist shot the Communist Leader of the Opposition the country, and all of Europe, held its breath. There was even a bomb threat at St Patrick's Cathedral in New York City. There were riots and demonstrations in the big northern Italian cities. With that year's Tour at it's most crucial stages in the mountainous Alpine passes, the Christian Democrat Prime Minister rang Gino in his hotel, and begged him to win the Tour if he could - for Italy. What follows in the book is a very well written passage of chapters concerning the dramatic victory Gino achieved, against the odds, in the worst cold and wet altitude conditions that the notorious Col d'Izoard and Col du Galibier passes could throw at him. The glory was his, and back home in Italy the country collectively exhaled, the wine was brought out, and everybody danced! The Tour director, who had also doubted Gino, offered his own poetic account of all that had passed. "From snowstorm, water, and ice, Bartali arose like a mud-covered angel, wearing under his soaked tunic the precious soul of an exceptional champion." In the calmer years following the end of his glorious career Gino would avoid discussing what had happened during the war for much of his life. Gino justified his silence as a matter of respect for those who had suffered more than he had during the war: "I don't want to appear to be a hero. Heroes are those who died, who were injured, who spent many months in prison." Overall, I enjoyed this book tremendously, though I admit I am a tiny bit disappointed that certain aspects weren't given more pages. For example - much of Gino's career was either not ever mentioned, or possibly edited out. Apart from the early rapid rise to the top, we only really get discussion of his two Tour wins and little else. Not enough was made of his great rivalry with Coppi. It would seem that the authors made a conscious decision to focus on the wartime exploits of this fascinating man, and that is understandable. On the whole, it is very well-written, and a truly enthralling story of a genuinely impressive man. Firstreads giveaway: The title definitely intrigued me as I am bound to read anything to do with WWII. It's interesting to learn about other aspects of that particular time period, especially since my knowledge of Italy's involvement is limited. All in all, I found this account of Bartali's life to be very thorough and quite engaging at times. Will I read more about Bartali specifically? Probably not. However, it was eye-opening and I recommend it to anyone wanting a new perspective on Italy dur Firstreads giveaway: The title definitely intrigued me as I am bound to read anything to do with WWII. It's interesting to learn about other aspects of that particular time period, especially since my knowledge of Italy's involvement is limited. All in all, I found this account of Bartali's life to be very thorough and quite engaging at times. Will I read more about Bartali specifically? Probably not. However, it was eye-opening and I recommend it to anyone wanting a new perspective on Italy during WWII or people who actually know who Gino Bartali is. Good book about cycling in Italia and France in pre-war, during and after World War II. It gave me a lot of insight into origins of cycling itself which I did not fully expect. It is about the history of Bartali but the writers did a wonderfull job of providing a lot of background stories which only added to this book. Great true story of an athlete who stood up to the Nazis by helping the Jews. He also won the Tour de France (more than once) and the Giro (Italy's bike race). Great story especially if you're a fan of the Tour de France. Road to Valor had so many fascinating separate themes I was interested in, making for an easy five star rating. From a history of the Tour de France to World War 2, Italian history in the 40's, and Nazi occupation of Florence. The story of Gino Bartali's involvement in smuggling fake documents through Tuscany on his bicycle and his TDF victories in 1938 and 1948 made for a powerful read. inspiring and a little boring, then inspiring again. but a great story. This book tells the compelling story of Gino Bartoli, an Italian who lived a humble childhood, and then went on to win the Tour de France twice. The description of his assistance of those persecuted during World War II, particularly his work as a courier of identity papers which he hid in his bicycle frame, was very uplifting. I don't like non fiction books - this one read like fiction. True page turner, incredible, true story. I am a fan of cycling autobiographies and have a keen interest in WW2 history but have never been a huge biography lover. That said, how can a book fail to impress when telling this story! I knew little abaout Gino Bartali before reading this, for me he was another name in the record books of a sport I love but from an era I knew little about. Born to a poor but loving family in a small town outside Florence, Gino worked hard to earn the promise of his own bicycle as a boy. Once Wow!! What a story. Born to a poor but loving family in a small town outside Florence, Gino worked hard to earn the promise of his own bicycle as a boy. Once he had his own bike, like many boys it became his passion and he loved racing his friends around Tuscant but was forbidden by his family to race seriously. When Gino constantly pleading and various local cycling figures making suggestions, his father finally relented, allowed him to race. Gino soon realised his talent and started a successful career as a professional athlete winning the Tour de France and Giro D'Italia with brief hiatus' after the death of his younger brother (in a cycle race) and internal politics from his fascist government messing with his race programme before the onset of war. During the war, Gino saved countless lives both directly (harbouring the family of a Jewish friend he had met whilst working as a bike mechanic) and indirectly, by aiding the Italian resistance, carrying fake ID cards and papers for sheltering Jewish families within his bike frame and causing distrubances to distract gaurds whilst fleeing familes were train hopping. For his part Gino was interogated by Fascist officals but was realeased after revealing nothing about his activities and continued his work until peacetime. After the war, Gino resumed racing but with his best years lost to the fighting he was written off as too old by the press during the 1948 Tour de France, however, with the backdrop of riots and political unrest back home in Italy after the attempted assasnation of the leader of the opposition party, Gino received a phone call from the then Prime Minister and personal friend, urging him to win the the Tour for Italia. Gino reacted by trouncing his opposition the following day, turning a 20 min deficit, until a 60 secoind one and would repeat the feat the following day to take the Yellow Jersey and win the tour. 10 years after his original victory. The book also gives much history into Musolini and Hitlers allegiance, in particular the role of Florence and then the seige of Florence when the allies liberated the city. "If you're good at a sport, they attach medals to your shirts and then they shine in some museum. That which is earned by doing good deeds is attached to the soul and shines elsewhere." This was 2-time Tour de France winner Gino Bartali's explanation to his son about why over many decades he had spoken so little and revealed even less of his WWII efforts on a bike to help hide and protect Italy's Jews in Tuscany. A humble war hero who never wanted to be known as such, because he was not injured, "If you're good at a sport, they attach medals to your shirts and then they shine in some museum. That which is earned by doing good deeds is attached to the soul and shines elsewhere." This was 2-time Tour de France winner Gino Bartali's explanation to his son about why over many decades he had spoken so little and revealed even less of his WWII efforts on a bike to help hide and protect Italy's Jews in Tuscany. A humble war hero who never wanted to be known as such, because he was not injured, was not imprisoned for months or years, and lived through the war while many did not. The story of Gino Bartali's assistance to the network of Catholic cardinals, archbishops, and priests who sheltered, hid, fed, and transported Italy's Jews during WWII's Fascist and Nazi regimes has only relatively recently come to light, and this book is the most comprehensive to-date. Hiding counterfeit identification cards for Jews and other secret documents about roadblocks, security checkpoints, and troop movements rolled up in his bike frame, the internationally renowned cyclist was recognizable anywhere he went on a bike and neither Mussolini's Fascists nor Hitler's Nazis had any real suspicions that Bartali was doing anything other than delivering military messages (his assigned duty) or training for cycling races, some of which continued on during the war. He rode thousands of miles between cities and towns across Tuscany, bringing counterfeit identification documents to Catholic clergy who distributed them to desperate Jews needing official documents that hid their Jewish heritage. The network and operation of this rescue effort was impressive and touching. Most of the Jews Gino helped by smuggling documents in his bike frame never knew how they got their life-saving papers or who delivered them, and that is how Gino wanted it. He helped because he saw the cruelty of what happened to those who were caught, and it was the right thing to do, even at risk to himself. His celebrity helped him evade serious scrutiny at checkpoints, with most of the Fascist thugs wanting his autograph more than to hassle him about where he was going and why. After all, he was a Tour de France and Giro d'Italia winner, so where else would he be every day but on a bike riding like the wind? Cardinal Dalla Costa's recruitment of Bartali to assist the Jewish rescue operation was, I believe, inspired. Hundreds of Jews survived the Mussolini years and WWII in Tuscany because Gino and many other brave residents in the area saw a need and acted, each with a separate skill that was essential to the Jews. The printer-turned-counterfeiter who crafted the convincing identification papers needed to get food, hold a job, or pass by security checks on the street, was an avowed atheist. Christians and atheists uniting to protect their community's Jews from being herded into internment camps. One wonders whether that kind of unity can be found again in our world today. I was particularly moved by the story of a nun known as Mamma Cornelia, who helped operate a Catholic school that hid Jewish children among the Catholic students. Mamma Cornelia learned all of the Jewish religious rites, rituals, prayers, and worship methods, and in evenings taught these to the Jewish children at the school so they would know their own faith and develop it in the absence of their parents in hiding. By day she taught them all of the Catholic Catechisms, not to convert them, but to protect them from Fascist and Nazi soldiers and secret police who frequently conducted spot checks quizzing the children on Catholic teachings, trying to trip up any Jews who might be hiding among the students. Mamma Cornelia quietly mouthed the words to the children just in case one of them forgot or nervously hesitated a response. This part of the book touched me deeply. She loved them because they were God's children, regardless of what faith they practiced. Simple love and compassion. After the war years, the book focuses on Gino's resumption of a cycling career, now a much older man who missed many years in his prime delivering counterfeit identifications rather than training and racing big international races. The second half of the book offers a look into postwar Italy, the devastation left behind by the retreating Nazis, and the volatility of rebuilding Italy. Deep political divisions emerged. Unrest and strikes nearly resulted in revolution or civil war that could have split Italy into two nations. In 1948, Bartali falls behind early in the first fully competed postwar Tour de France with nearly all traditional cycling nations (except Germany) represented. Everyone gives up on Bartali. He was significantly older than his competitors and looked it in the early stages. Then something happens to ignite a flame in him, and all of Italy pauses from its internal political strife and violence to follow updates on Bartali's progress toward Paris. The final chapters reveal what happened and how it affected Italy. A reader does not need to have significant cycling knowledge to appreciate this book, although there is a lot of detail about key races in Bartali's career before and after WWII. By percentage, the chapters about his efforts during the war to help Cardinal Dalla Costa rescue Tuscany's Jews are few, but they are impactful and sufficient to tell the story well. Some reviewers criticized the book for what they perceived as the limited treatment of Bartali's role in saving, but the authors researched for 10 years and included everything there was to find about Bartali's role - which he chronically downplayed whenever asked. Like many of the WWII generation, Bartali did not like to talk about his experiences, and the other witnesses who had firsthand knowledge likewise did not write journals or talk openly about what they saw and knew for decades after the war. Many died without ever telling anyone the secrets they had trained themselves to keep as a survival mechanism. As that generation passes away witness by witness, most of the details of what people like Bartali did in their corners of the war will disappear forever. We are fortunate that even this modest amount of information exists about Bartali. His record still stands today - the longest time gap between Tour de France victories (1938 to 1948). He was an inspiration to a traumatized Italy before and after the war. However, his greatest feats on a bike came not on the famous streets of Paris or France's mountain passes in the Alps and Pyrenees. They came racing along deserted Tuscan dirt roads at an average of 32 mph as dusk settled and the Fascist/Nazi-enforced curfew approached, with papers rolled up tightly and stuffed into his bike frame, offering the hope of safety and survival to Italy's most vulnerable citizens. I have never heard of Gino Bartali until I read this book. What I found more fascinating then Gino was about the Tour de France and the job he had as a bike messenger during the war to help the Jews. Gino was alright but at times his competitive nature overshadowed him and made him have a bit of a bad attitude. Not that I am saying that competition is a bad thing as I can get really competitive when it comes to certain things but there is a line to draw and you have to know when to turn it off a I have never heard of Gino Bartali until I read this book. What I found more fascinating then Gino was about the Tour de France and the job he had as a bike messenger during the war to help the Jews. Gino was alright but at times his competitive nature overshadowed him and made him have a bit of a bad attitude. Not that I am saying that competition is a bad thing as I can get really competitive when it comes to certain things but there is a line to draw and you have to know when to turn it off at times. Of course, if it was not for Gino's never give up attitude then he would not have won the Tour de France twice and been an icon in the cycling world. An interesting look at an elite cyclist in the 1930s and 1940s who resisted the Nazis in Italy and helped protect Italian Jews. The book was well-researched and held my interest, but the writing wasn't great. In an attempt to make it seem more real, the authors were heavy handed with the descriptions, and sometimes I wished they would just shut up and tell me what happened. I learned a couple of interesting things from this book. First, was the role the Catholic priests and nuns played in protec An interesting look at an elite cyclist in the 1930s and 1940s who resisted the Nazis in Italy and helped protect Italian Jews. The book was well-researched and held my interest, but the writing wasn't great. In an attempt to make it seem more real, the authors were heavy handed with the descriptions, and sometimes I wished they would just shut up and tell me what happened. Gino Bartali was a hero in many ways. He won the Tour de France in 1938, during the war he used his fame to carry messages and identification materials for the archbishop of Florence, Cardinal Elia Dalla Costa to a secret network that saved Jews. He also saved a family of Jews who were friends in a cellar in Florence. Truth is stranger than fiction. In the 1948 Tour de France, all think Gino is too old and will lose. Then, there is an assassination attempt on the head of the Communist party (Tog Gino Bartali was a hero in many ways. He won the Tour de France in 1938, during the war he used his fame to carry messages and identification materials for the archbishop of Florence, Cardinal Elia Dalla Costa to a secret network that saved Jews. He also saved a family of Jews who were friends in a cellar in Florence. Truth is stranger than fiction. In the 1948 Tour de France, all think Gino is too old and will lose. Then, there is an assassination attempt on the head of the Communist party (Togliatti) causing riots throughout Italy. The Christian Democratic Prime Minister De Gasperi calls his friend, Gino, saying that a win would help re-focus everybody in Italy. This rallies Gino and the Italian team, and he wins the 1948 Tour. This was a record for the longest time span between victories that is undefeated. "I don't know if I saved the country, but I gave it back its smile." Road to Valor, the story of Gino Bartali, who won two Tour de France, and holds the record for the longest time span between wins. Worth the read for a look at a dedicated athlete and family man before the doping took over the sport. Indeed, some of the training methods are bizarre! But his record as a cyclist is real, as was his work in the Italian Resistance, saving hundreds, if not thousands of Jews from the Nazi and Fascist aggression. His 1948 Tour win is credited with "giving Italy back it Road to Valor, the story of Gino Bartali, who won two Tour de France, and holds the record for the longest time span between wins. Worth the read for a look at a dedicated athlete and family man before the doping took over the sport. Indeed, some of the training methods are bizarre! But his record as a cyclist is real, as was his work in the Italian Resistance, saving hundreds, if not thousands of Jews from the Nazi and Fascist aggression. His 1948 Tour win is credited with "giving Italy back it's smile" at a time of internal dissension that could of resulted in a civil war. This book would make a great movie. I think I will amuse myself by dreaming up movie titles and replaying the race scenes in my head: over the Alps through snow and sleet, with descents down hairpin turns through mud and gravel. Imagine the impact of seeing Bartali's closest rival in the 1948 tour, Louis Bobet, crossing the finish line "utterly defeated, his face... covered in mud, except for the tiny furrows where tears had fallen down his cheeks." Che qua non trovi il gel di Cristiano Ronaldo ma la strada sterrata da valicare e la dignità di un campione che ha lasciato traccia di sè non solo sui pedali. Che lo sport è tanto altro oltre alle prime 40 pagine della Gazzetta dello Sport purtroppo dedicate solo al calcio. An amazing history of how a cyclist used his god given talent to do good during the world war. I absolutely enjoyed this book and the heroism of many who sacrificed so much for others. Interesting biography of Gino Bartali, Italian cycling legend. A beautifully written, and well researched book describing the incredible life story of Gino Bartali. This book has found a permanent place on my shelf.